Last Saturday's magnitude 5.6 earthquake in Oklahoma not only shook the Boone Pickens Stadium at Oklahoma State, where the home team, the Cowboys, had just beaten the Kansas State Wildcats 52 to 45. This largest quake in the Sooner State's history shook a huge area. Almost 60,000 people tuned into the "Did you feel it?" website from the US Geological Survey and reported how they felt the shaking. Computers automatically plotted each of these reports on a map, where the color depicts the intensity of the shaking felt by the person reporting. Blue represents a very light rumble, yellow stands for strong shaking and dark red and brown means that you would be lucky to survive. The map of responses for the Oklahoma shaker covers an enormous area, ranging west to east from the Texas panhandle to Memphis, Tennessee, and north to south from Omaha, Nebraska, and Des Moines, Iowa, to Austin, Texas (see left panel in our figure). In total, the M 5.6 earthquake was felt in an area of more than 300,000 square miles, roughly three times the size of California. Now compare that with the shake area of the largest Northern California Earthquake in the last 22 years, the October 31, 2007, temblor on the Calaveras Fault near Alum Rock northeast of San Jose. With a magnitude of 5.4, this quake was just a little smaller than Oklahoma's quake. 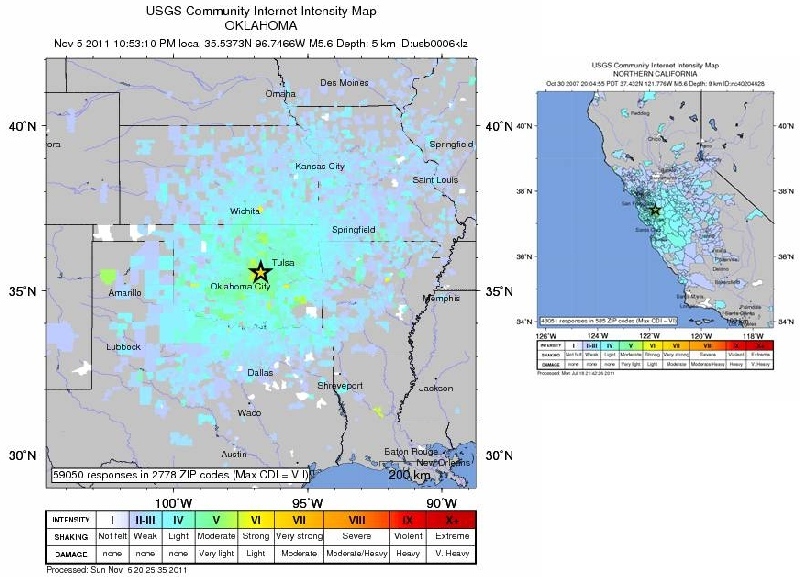 Although it was felt as far away as Redding in the north, Carson City, Nevada, in the east and Bakersfield in the southeast, the area of more intensely felt shaking was concentrated around the greater Bay Area (see right panel in our figure). The region where shaking was felt consistently covers only about 50,000 square miles. 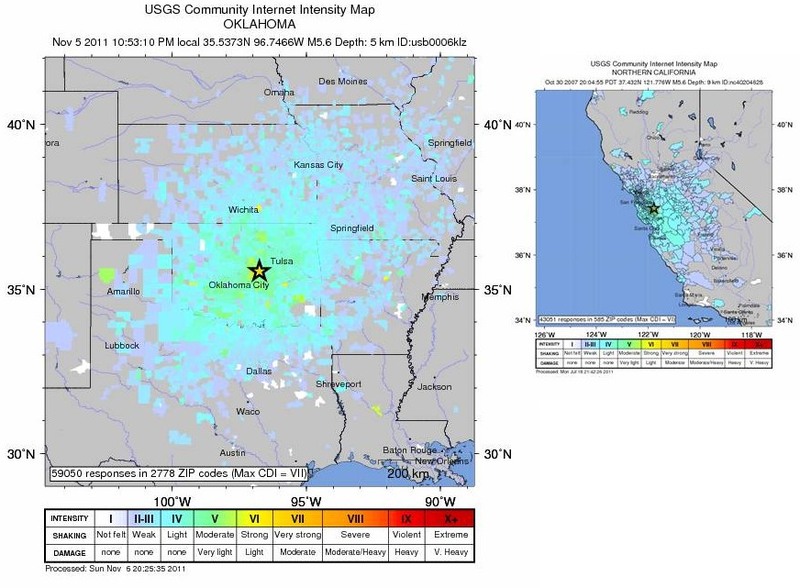 Even if you double that number because California is a coastal state and the shaking cannot be felt on water, the shake area of the Alum Rock quake is only about a third of shake region of the Oklahoma quake - even though the two quakes were comparable in magnitude.